The difference between “charging” a battery and “charging” a client is easy for people to understand. But for a computer, distinguishing between the various meanings of a word can be problematic. Linguistics researcher Katrin Erk has developed a new way to help computers learn natural language. For more than 50 years, linguists and computer scientists have tried to get computers to understand human language by programming semantics as software. Driven by efforts to translate Russian texts during the Cold War (and more recently by the value of information retrieval and data analysis tools), these efforts have met with mixed success. IBM’s Jeopardy-winning Watson system and Google Translate are high-profile, successful applications of language technologies, but the humorous answers and mistranslations they sometimes produce are evidence of the problem. A “charge” can be a criminal charge, an accusation, a battery charge or a person in your care. Some of those meanings are closer together, others futher apart. Our ability to distinguish between multiple word meanings is rooted in a lifetime of experience. The context in which a word is used an intrinsic understanding of syntax and logic, and a sense of the speaker’s intention all help us interpret what another person is saying. A computer can’t access these experiences, so it requires a lot of data to begin to “learn” the distinctions. But language isn’t always straightforward, even for humans. The multiple definitions in a dictionary can make it difficult even for people to choose the correct meaning of a word. Katrin Erk, a linguistics researcher in the College of Liberal Arts, refers to this as “semantic muck.” Enabled by supercomputers at the Texas Advanced Computing Center, Erk has developed a new method for visualizing the words in a high-dimensional space. 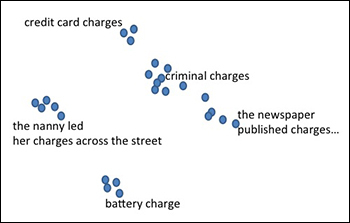 Instead of hard-coding human logic or deciphering dictionaries to try to teach computers language, Erk decided to try a different tactic: feed computers a vast body of texts (which are a reflection of human knowledge) and use the implicit connections between the words to create a map of relationships. Watch the video to learn how Erk uses the technology at the Texas Advanced Computing Center to help computers “learn” natural language. An earlier version of this story appears on the TACC website.